Going on a 1st grader&apos;s field trip to Taltree Arboretum and Gardens and Valparaiso University&apos;s Brauer Museum, who knew you could learn so much? Even in scattered rain, Taltree Arboretum is still an amazing place to visit. The 360-acre reserve includes gardens, wetlands, woodlands and prairies. 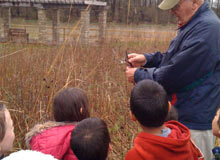 Our tour guide led us along the spacious trails where we saw the beginnings of spring growth. Numerous bluebird houses, monitored and studied by the arboretum, were dotted along the trail. The students were amazed at the giant oak tree which towered over their heads. We learned all about the restoration done by the founders and how this wonderful reserve came to be. I hope to take the kids back in the late spring when the arboretum really comes to life and to see the incredible new Railway Garden which opens at the end of April. Learn more about Taltree at www.taltree.org. Our second stop was to Valparaiso University&apos;s Brauer Museum of Art. Did you know they had more than 3,000 works of art in a rotating display there? The collection includes works from Frederic Edwin Church, Asher B. Durand and Georgia O&apos;Keefe. It also includes a number of works by Frank V. Dudley. The students learned Dudley&apos;s stunning paintings of the Indiana Dunes helped launch a movement to preserve the beauty of the dunes and to the creation of the state and national parks. The museum is free to the pubic. 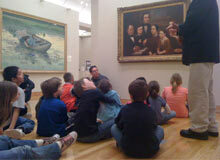 Find out the Brauer Museum of Art&apos;s hours and current exhibits at www.valpo.edu/artmuseum. Though we returned a little wet (and to the kids delight a little muddy), it was a trip which opened the students eyes to Northwest Indiana&apos;s natural beauty and the painted canvas.